Despite our globalized, web-connected planet, Americans remain puzzled, yet fascinated, by Asian culture and its impenetrable sheen. Though Israeli filmmakers Shosh Shlam and Hilla Medalia claim their 2014 Sundance hit, Web Junkie, exposes a worldwide epidemic on internet addiction, it’s really about a culture as alien to Westerners as it gets: China. Entertaining as it is, Web Junkie can also be frustratingly hands-off. What is up with these kids? Are they common, or extreme cases? How did the parents allow them to end up this dysfunctional? Is this really a worldwide phenomenon? None of these questions are answered, though you do get some hints throughout. China’s single-child policy has led to a lot of lonely teenagers with tiger parents who are clueless about connecting emotionally with their kids. It’s not hard to picture the internet as a much more appealing alternative for these adolescents, but it’s a mighty leap to go from obsession to utter dysfunction—one that has, in some cases, led to kids keeling over at internet cafes from lack of nutrition. I don’t deny there’s a problem there, I only wish I better understood the how’s and why’—two aspects of the story that Web Junkie never really answers. The camera is often peering from behind half-open doors and windows, placing us and the filmmakers in the same outsider’s boat. We want to get closer, but Shlam and Medalia won’t let us. Is that artistic intent or just bad storytelling? It’s a little hard to tell. On the other hand, the DVD extras help a lot. A podcast with the filmmakers sheds useful light on the project, despite their claim that this is a worldwide epidemic. Really? I’m sure there’s a kid somewhere around here with that level of addiction to Candy Crush, but he’s probably an exception, not the rule. The cocktail that’s created this situation is uniquely Asian. Even more confounding are the deleted scenes: all three of them are stronger than anything in the film, providing insights lacking in the actual movie. The best one, involving a therapy session between father and son, shows you the discipline model most Chinese parents still follow: Dad regularly beats Son in order to “make him successful”, because “that’s what worked for Jackie Chan. Don’t you want to be like Jackie Chan?” The boy’s raging resentment is this close from erupting into a fit of violent payback, and the scene finishes with the father privately wailing. Dad clearly has no clue why his son hates him so much. How on Earth did this material end up on the cutting room floor? In the end, Web Junkie is ballsy, fascinating, and frustrating. 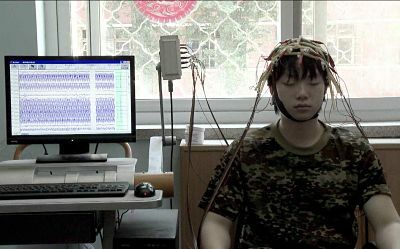 It doesn’t flinch one bit as it transports you to China for an hour-long, eye-opening journey, but it also fails to explain much- which might be just how the filmmakers want it. Ultimately, it’s a film not about internet addiction, but a brief look at culturally-induced psychosis, Chinese style.